What is the Difference Between an Ice Fishing Fish Finder and an Ice Fishing Flasher? Having a fish finder on hand designed for ice fishing scenarios can be an invaluable tool on the ice. By being able to “see” what is obscured under the ice and through many feet of water, you can effectively target fish with precision. Modern ice fishing units are able to incorporate a variety of functions such as GPS, fish finding, and ice fishing flasher modes to make them more versatile. Many units can even be used interchangeably between sitting on the ice and mounting to a watercraft. Let's see why you ought to consider an electronic fish finder for our ice fishing endeavors. Ice fishing flashers are one of the first and most commonly used electronic devices for ice fishing. There are traditional, stand-alone ice flasher units, along with units that incorporate fish finder and GPS functions, as well. Flashers are merely portable sonar units that allow you to view what is going on beneath you under the ice through the use of a sonar beam that emanates from the unit. An ice fishing fish finder works very similar to the types of units you would use on a boat. They vary depending on the available features but generally work the same. They have an external transducer that must be placed in the ice hole to read what is below you. On the screen, a variety of colors represent different types of signals depending on the hardness of the objects below. A fish finder will not only just allow you to view the fish at different depths below you, but it will give you a glimpse into the habitat composition of the water column and lake bottom below you. While a fish finder displays a variety of shapes below you, a traditional ice fishing flasher has a clock-like circle. This circle represents increasing depths in a clockwise manner. Shapes appear around this circle to indicate what is below. Like a fish finder, different materials have different color representations. When an object is present in the field below, a color appears according to the object's “hardness”. Generally, green is a soft reading such as plants or fish, while red is a hard reading such as a rocky bottom. Flashers are designed for vertical jigging applications, and a key component for a flasher is the ability to detect even small jigs. This allows you to fish with your lure at the exact depth necessary. The flasher also allows you to detect the holding depth of fish. Additionally, it enables you to see when a fish moves in order to check out your lure or jig and anticipate a potential strike. A full-featured, all-purpose ice fishing unit should incorporate several types of functions. As discussed above, a full-featured ice fishing unit will be able to serve as both a traditional ice fishing flasher and a modern style fish finder. Additionally, many of these higher end units incorporate GPS functions to help you keep track of important spots on the ice or in your boat. A truly versatile ice fishing fish finder should incorporate all of the above. Having an ice flashing/fish finding/GPS unit will open up a myriad of opportunities for you. It will also trim down your gear hoard by combining three units into one compact and convenient package. In today's market, it can be difficult to know which ice fish finders are truly the best. An outstanding ice fish finder should have all the leading edge functions in order to catch the most amount of fish. Continue reading our reviews to help you choose the best ice fish finder. If you are looking for a powerful, all-in-one unit to serve as a GPS, ice fishing flasher, and fish finder; this may be your unit. The Garmin Striker Plus 4 is a compact unit weighing less than one pound and features the well-known CHIRP technology for ultra-clear, precise images. This unit has a full-feature ice fishing flasher display mode as well. The GPS features allow the user to mark waypoints and place tracks on water or ice across a wide variety of downloaded map layers. The traditional fish finder feature allows the user to mount to a boat for use and is available in several different screen display sizes. The Garmin Striker 4 is an excellent choice for those wanting to combine their assets into one powerful tool. You can have three separate tools for the job or one tool to do it all. The latter is the case for this Garmin unit. Many reviewers agree this is one of the best units for value on the market. Equally at home on a boat or on the ice, this unit will help make fishing quicker and easier. The versatility of this unit is truly hard to beat. At the size of a conventional fishfinder and with its accompanying features, you would think that's enough. However, this unit also allows users to utilize traditional ice-fishing flasher mode for vertical jigging. At a budget price, this deal is truly hard to beat and is a great multi-purpose tool for your fishing toolbox. 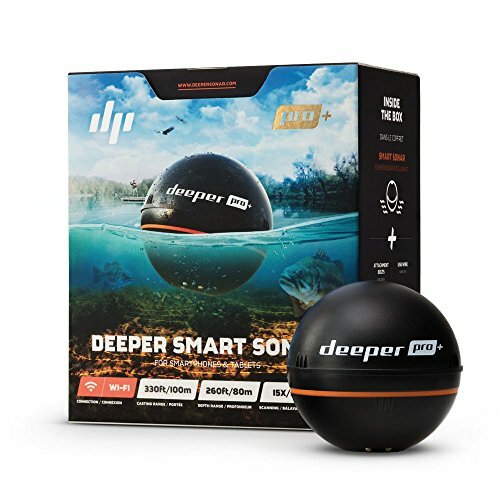 A new and innovative product on the market, this Deeper Smart Sonar PRO combines the power of your smartphone with a non-traditional transducer. When you buy this unit, you get no display screen. Instead, the spherical transducer pairs up to your smartphone device via integrated WiFi to serve as your display. You can choose from a variety of different display modes including GPS, ice fishing flasher, and fish finder. The true ingenuity of this spherical transducer is its versatility in fishing applications. This unit can be attached to your boat or can be cast out into the water to obtain a reading from a specific area. This feature makes it one of the only shore-fishing compatible fish finders. There are many different adjustments to fine-tune your readings. Some of these include, sensitivity adjustments and cone angle adjustments. If you are looking for the next new step in fish finder innovation, be sure to check this one out. Offering extreme versatility for use on a boat, on the ice, or even on the shore, this castable, spherical transducer is one of the most powerful on the market. If you like to have your smartphone as a multi-purpose device, consider using it as your new fish finder. While this unit won't break the bank, you are going to pay for this great technology and convenience. The Venterior Portable Fish Finder is a palm-sized, simple functioning fish finder. This is good for beginners on the tightest of budgets who may not be quite ready to jump into a more expensive unit. At a super-budget price, it is a quick sell, though be aware that it may lack the quality of some higher end units. This device is able to detect rocks, weeds, and fish down to a depth of over 300 feet. The sensitivity of this unit only allows detection of fish within four inches. This may not work for many ice-fishing scenarios when you need to be able to detect small lures and jigs. It also lacks an ice flasher feature best used in ice fishing and jigging scenarios. This portable unit lacks many of the features and precision of other units on the market. However, for the price, this device functions as intended for a fishfinder. If you desire a dedicated ice-fishing setup though, there are better options. The Dragonfly PRO by Raymarine is a slick looking, LED-backlit display unit guaranteed to look great on your boat. The all-weather screen is optically bonded for beautifully sharp color and wide viewing angles and is available in three different sizes from 4.3 to 7 inches. This unit features dual sonar modes. One is a wide spectrum CHIRP mode, for photo-like images of the world beneath your feet. The second is a conventional colored fish finding display to target even small fish. 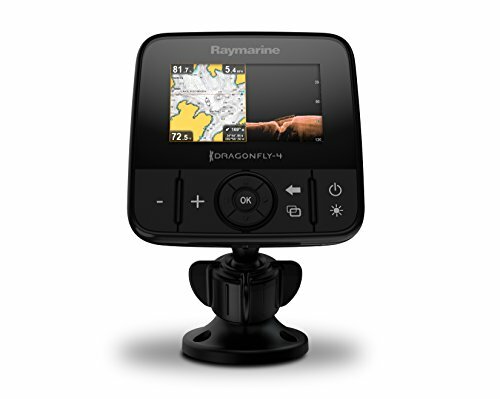 This unit comes pre-loaded with a large variety of maps to serve well as a GPS unit when navigating waters. You can even generate up-to-date bathymetric maps when you pair the unit with the Navionics SonarChart Live app. The flexible mounting options make installation versatile and simple on your watercraft. This is a powerful and well-built fish finding unit. With a modern look and design, it features simple to use touch controls to make gloved use less of a pain. You can use this unit as a GPS or fish finder, but it lacks an ice flashing mode. 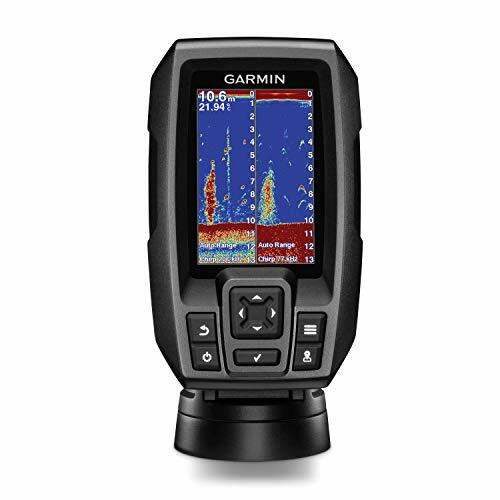 The dual spectrum sonar allows you to view crisp CHIRP imagery or traditional colored sonar. While this unit is more designed for mounting on a watercraft, there is nothing keeping you from taking this unit out onto the ice. Humminbird is a big name in boat electronics. They deliver once more with this Helix 5, a high-quality and ultra-precise unit that is packed with versatility and multiple functions. The brilliant display screen allows the user to cycle through the different functions with large, easy to push buttons. The new Switchfire technology allows users to select between two different sonar modes. Furthermore, the user can add or remove certain details from the display; such as vegetation. With the Humminbird Basemap, thousands of different maps are already at your fingertips. Additionally, with Autochart Live, you can constantly create your own bathymetric maps of your favorite fishing holes. 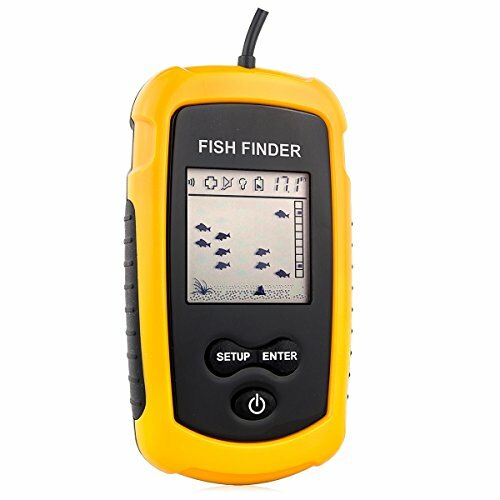 If you are looking for a more boat-minded, ice fishing fish finder, check out this full-featured unit. 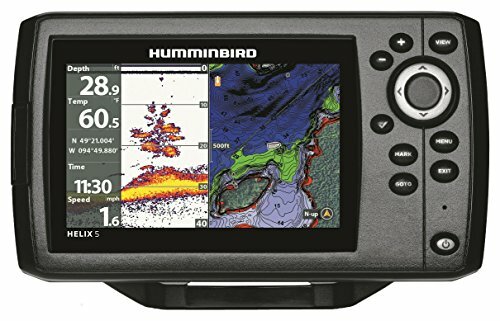 Humminbird is a big name in fishing electronics and certainly delivers all it is known for in the Helix 5 unit. This unit gives users nearly everything a good ice fishing fish finder should have, with the glaring exception of an ice flashing mode. Multiple different viewing options, layer selectivity, included maps, and the ability for your unit to record and create maps make this one a hard-to-beat unit. For those unfamiliar with fish finders, they are quite simple and user-friendly. If you’ve previously used a traditional fish finder, using one for ice-fishing is hardly any different than using them on a boat. You must first drill an ice hole into the ice to be able to hang the transducer in the water. At first glance, you should be able to see the lake bottom on your fish finder screen. It will be a colored portion at the bottom of the screen and allows you to see how many feet of water there are below you. If your fish finder is sensitive enough, you should be able to drop your lure into the hole and see it pop up on the screen. The shape and color of objects will vary by each unit. Fish will show up on the screen as a pre-specified shape and color. As the unit continually scans, you will be able to see any fish and whether or not they are reacting to your lure. As discussed in the following video, a fish finder gives you a quick glimpse of the world below you. If you don’t see any fish on your screen after several minutes, consider moving to a new ice hole until you can “see” some fish to target. Objects will appear differently on the screen depending on their size and “hardness” primarily. By familiarizing yourself with the owners manual and through hands-on use in the field, you will soon be able to read your fish finder like a book. Watch the following video to learn how to use an ice fishing fish finder. By now you should have gained a little more knowledge of ice fishing fish finders. There are a variety of features that you must choose from to select the perfect unit for you. Thankfully, most modern units combine GPS, fish finders, and ice flashers all into one easy-to-use electronic unit. When purchasing a unit, keep in mind the features that you will actually require and will put to use. Decide the amount of time your unit will spend on your boat vs. on ice to best select your unit. Now it's time to make your decisions and get ready to start learning your way around your new ice fishing flasher for your upcoming fishing season.